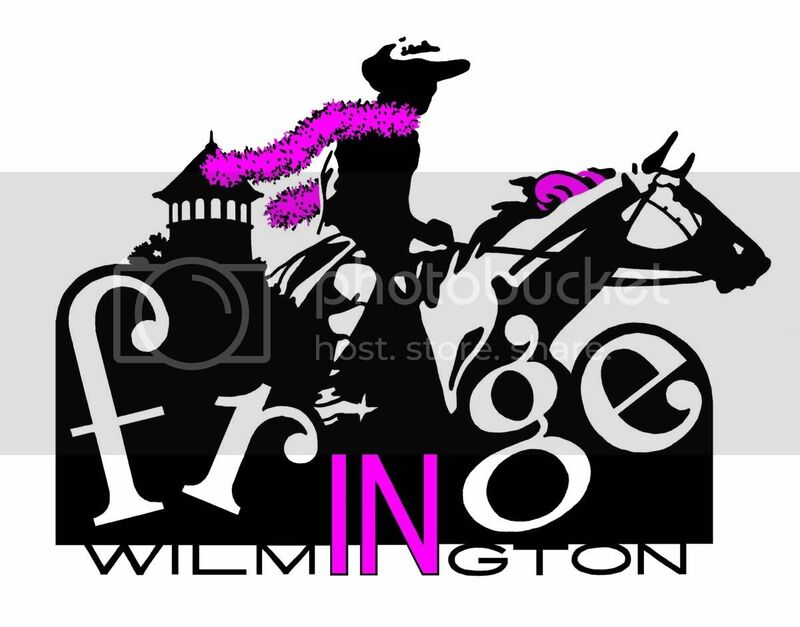 I wanted my time at the second Wilmington Fringe Festival to be as bizarre, surreal and extreme as possible; unfortunately, it's impossible to see everything. I set my interary with the 48-Hour Film Festival at the center, plus some offbeat live performances, as well as the Visual show. On Wednesday, I kicked things off with a tour of the Visual Fringe Gallery at the Shipley Lofts. The work ranged in visual media, from installation to video, illustration, painting and sculpture. It was a strong show overall for sure, with some standouts: Stephanie Bell's "Anxiety" series confronted viewers as they entered, with a gas mask-wearing woman with "guts" of wire spilling out of her stomach. Downstairs, I was most fascinated by Tiernan Alexander's "Cuddle," a wood cradle strewn with braided human hair and Daniel Potterton's pieces, which appear to be collages of found objects (things like take out menus, tickets, torn pieces of product packaging), but on close inspection are completely, intricately created by hand. An installation/performance piece by Ron Longsdorf was projected on one of the walls - a live Skype stream of the artist and a friend having a conversation in a cafe in South Carolina. Skype makes an interesting art medium, especially as viewers realize that they are also being video streamed to the other side (more on the piece here). For a full list of Visual Fringe artists, click here. Thursday I hit Theater N for a volunteer shift, and to check out the 9:00 show; I lucked out a bit, because the sold-out Film Brothers' Festival of Shorts went long, and I was able to screen a few of the films. I'm especially glad I got to catch Luke Matheny's "God of Love," a comic fantasy about a lounge singer with amazing aim. Though it's hard to pick a favorite thing out of so many during the festival, this short was definitely one of them. The Festival of Shorts was followed by a screening of Owen Jackson's "The Adventures of Mercy Walsh," essentially a spoken word piece of surreal storytelling and poetry set to imagery of the river, the sky and a collage of vintage film footage. "Crypto-Anthropology" was an anticipated piece, with its classic horror themes and "fun house freak show" description. The two players from Phantom Limb Productions seemed taken aback at the full gallery on Friday night (the cast list on the program sheet lists eight players, suggesting that some improvising was called for). The show was bizarre, as promised, the characters at times moving in and out of character (whether that was scripted, I don't know). The zombie segment, especially, was a kick, with its miniature sculpture-slash-zombie puppets. I caught all 20 of the submissions to the 48-Hour Film Festival on Saturday; if you're not familiar with this extreme filmmaking competition, it goes like this: filmmakers of all kinds and ages meet on a Friday night to receive several required elements, including the film's genre, location, a prop and a line of dialogue. The films must be scripted, shot, edited and scored by the end of the weekend. During the screening, it quickly became clear that this year's required dialogue involved the Delaware Lottery, handing the artists a special challenge: how to work a line like "Delaware Lottery... wanna play?" in seamlessly. Not an easy thing to do. It worked well when weaved in the background, such as in IndieFrameFilm's drama "Acceptance" (winner in the Drama category) but also when the line was used as the theme of the whole film, as in the musical "112 Large" by Lasallian Reanimation (winner in the Musical Category and Group A Audience Choice). There were few dull moments, with entries featuring evil clowns ("Twisted Toys"), absurd comedy (Youth category winner "Tour Guidance"), stirring spoken word ("A Long While"), and a non-animated cartoon ("Film Pirates"). By far the biggest audience reaction went to Fire Breathing Kittens' "The Last Masterpiece," the only film in the festival to receive a warning before it was screened. Though it was in the Drama category, it was more of a very dark, very extreme comedy involving bodily functions. It no doubt would have won if there were a "Most Shocking" category -- as it was, it received an Honorable Mention. The Overall winner was “The Wilmington Project” by Zach Decktor, Bill Dowling & Brendan McKeown, a comedy about a mad scientist, his only friend, and a giant slinky that attacks Wilmington, and features a cameo by comic Colin Mochrie. Watch the winning film here, and see the complete list of winners here. My last show was "The Story of Invention," a two-woman show from the Unsaddest Factory Theater Company out of Baltimore. The performance deal with insomnia, invention and reality, switching back and forth between different planes. As one Lola Pierson plays one character as a constant in all realities, Anna Fitzgerald plays several, including a puppet and special effects. A fun, and at times poignant, show, and a nice way to round out the 2010 Festival. For more, see Jessica's Fringe Wilmington 2010 Recap.